SEATTLE – I hear a lot of talk about Huskies forward Matisse Thybulle being the Pac-12 Defensive Player of the Year. I think it’s silly. Not because he’s undeserving, but because he isn’t just the conference’s defensive player of the year – he’s the conference’s player of the year. And I’m not sure it’s all that close. Fellow Husky Jaylen Nowell has been fantastic this season. Same is true of Oregon State’s Tres Tinkle. But they’re not impacting games in the manner that Thybulle is. When it comes to getting stops, the man is unstoppable. Thybulle is in the midst of one of the most impressive defensive seasons in NCAA history. He’s racked up a nation-leading 3.6 steals per game along with 2.3 blocks, putting him in position to be the first player to finish a season averaging three steals and two blocks. Just last week, he averaged 13.5 points, six steals, five rebounds and 4.5 blocks, earning his first Pac-12 Player of the Week award. 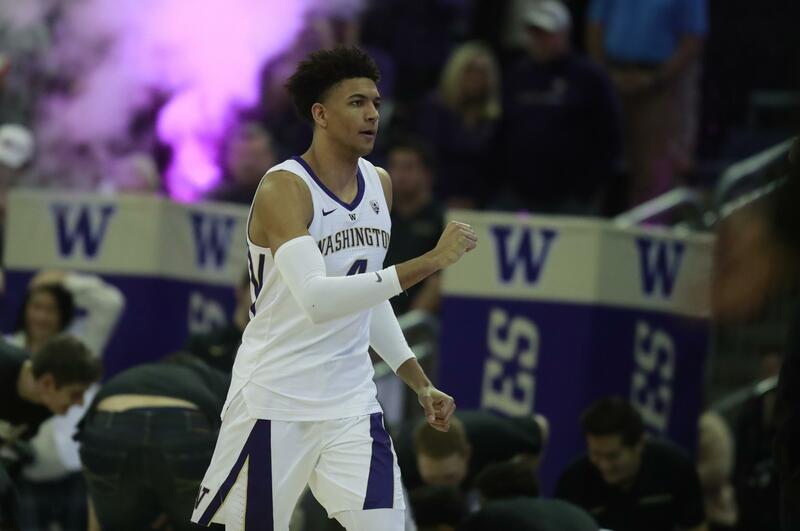 Within this season, Thybulle is in the midst of maybe the best defensive stretch in Pac-12 history. In his past eight games, he has tallied 44 steals (5.5 per game) and 19 blocks (2.37) – including 12 and nine, respectively, last week against Utah and Colorado. For pretty much anyone else in the country, netting six steals and five blocks – as Thybulle did against the Buffaloes – is a career game. For Matisse, it’s just a Saturday night. As for Matisse’s thoughts on his numbers? “I got nothing,” he said. Yup. No answer. Kind of like everyone he plays against. There’s a new advanced stat out there called box plus minus, which basketball-reference.com describes as a per-100 possession metric used “to estimate a player’s performance relative to league average.” It’s essentially basketball’s version of WAR, and it says that Thybulle is Achilles. Nowell’s box plus minus is a respectable 5.0. Tinkle’s is an impressive 8.1. Thybulle’s is 14.3. I scrolled through the stats of all 25 players on the Wooden Award watch list and found one player – Duke’s Zion Williamson – who had a better BPM than Thybulle. Even more impressive is that Thybulle’s defensive BPM is 10.5, meaning that if this stat is a true reflection of a player’s value, he’d be the Pac-12’s best player if he never took a shot. The thing is, though, he’s taking – and making – plenty of shots, particularly during conference play. In 14 Pac-12 games, Thybulle is averaging 10.6 points on 47.6 percent shooting and has shot 82.9 percent from the line. He has made 36.5 percent of his 3-pointers and scored a team-high 17 points in Saturday’s win over Colorado. Throw in the fact he’s averaging 4.1 steals and 2.6 blocks during conference play (for the season as a whole, nobody else in the Pac-12 is averaging more than 1.6 steals) and it’s hard to argue that anybody in the league is more valuable than Matisse. If you looked at steals the same way you did points, Thybulle’s been dropping between 35 and 50 every game for the past month. The senior’s 95 steals are 15 shy of Jason Kidd’s Pac-12 season record. His 300 steals are 21 shy of Gary Payton’s career Pac-12 record. He’ll have at least six games to break both, and at the rate he’s going, he likely will. The truth is, the conference – or the country for that matter – has never quite seen a player like Thybulle. Pac-12 Player of the Year? No question. Remember, Matisse is Carl Lewis. He’s running away with this thing. Published: Feb. 26, 2019, 2:14 p.m. Updated: Feb. 26, 2019, 5:46 p.m.